- Made in USA, Fast & free shipping. A perfect choice for wall decor at home and in office. Also makes a perfect gift. - 100% HANDMADE Each canvas print hand-stretched. Multiple sizes available. - State of the art 12-ink Giclee print technology from Canon ensures the best quality, realizes an expanded range which enables greater overall balance and provides more vivid colors. - Pigment-based inks rather than other inks found in lower cost inkjets. Pigment-based inks have a longer life span that can last over 100 years without significant fading. - Acid free archival quality premium canvas. 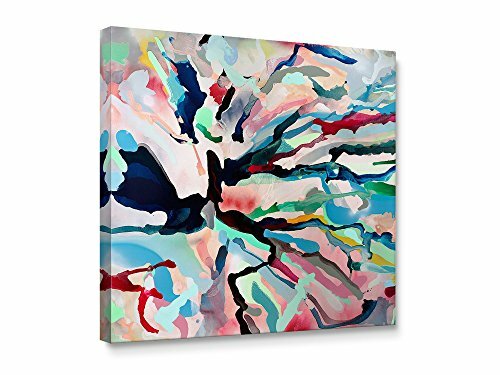 - Great wall deco art for living room, bedroom or lobby, makes a great a gift too.- Gallery Wrap. We are adding an extra 0.75-1.5 inch necessary for the borders using some pixels from the edges of your image and creating a border. - Real wood frame (Non-MDF) & Solvent-free Ink: odorless and can be used by someone with allergies and in kids' rooms. - Ready to hang. Hook is mounted inside of the frame so no gap visible between wall and the frame. Frame is wrapped very carefully in bubble or foam wrap to ensure safe shipping. Single piece, Size: 20"x20", depth: 3/4". Hook mounted & ready to hang. This painting is perfect for adding a decorative touch to any room's decor. Perfect for office wall, Lobby, Living room,Dining room. Made in USA, by Niwo Art (a US trademark), fast and free shipping. Great wall deco art for living room, bedroom or lobby, makes a great a gift too. State of the art 12-ink Giclee print technology from Canon ensures the best quality. Not a painting by hand, but a reproduction on premium canvas, gallery wrapped and stretched over real wood (non-MDF) frame. Since each computer display is different, color might be a little different on your screen. 100% refund guarantee. If you have any questions about this product by Niwo Art, contact us by completing and submitting the form below. If you are looking for a specif part number, please include it with your message.